Date of manufacture: 1940 - 1945. 90 to 110 V cold-cathode regulator. Current range: 1 - 8 mA. Dimensions /mm: 81 h, 28 diam. This un-gettered low-pressure neon tube still works perfectly 70 years after manufacture. 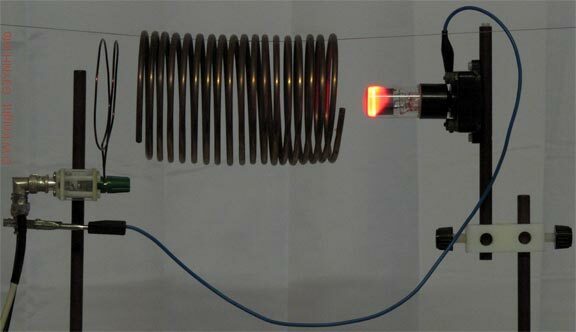 A glow discharge in the bulk gas is obtained by subjecting the tube to the strong electric field of a coil self-resonating at about 25 MHz. The anode pin (outer electrode) of the tube has been earthed to the shield of one of the cables connected to the induction coil. This increases the field gradient and enhances the glow. For more information on this setup see coil resonance experiments. Close-up of the glowing tube. The RF power has been turned up to make the discharge fill the whole tube. Without performing a spectroscopic analysis, the fill gas appears to be pure neon (it does not have the purplish tinge of a Ne-Ar penning mixture). 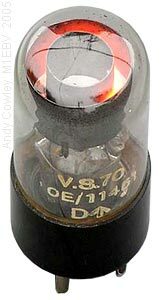 Right: The VS70 exhibits an unstable glow when used normally (i.e., with DC bias in the constant-voltage region of its characteristic). The effect is fairly spectacular, but the noise introduced into the running voltage is only of the order of a few mV, so does not affect its voltage regulation ability. For discussion of this phenomenon see the unstable cathode-glow article.